"✝" redirects here. For the typographical symbol, see Dagger (typography). This is a list of Christian cross variants. The Christian cross, with or without a figure of Christ included, is the main religious symbol of Christianity. A cross with a figure of Christ affixed to it is termed a crucifix and the figure is often referred to as the corpus (Latin for "body"). 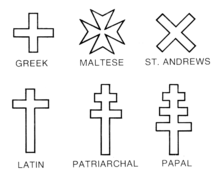 The term Greek cross designates a cross with arms of equal length, as in a plus sign, while the Latin cross designates a cross with an elongated descending arm. Numerous other variants have been developed during the medieval period. Christian crosses are used widely in churches, on top of church buildings, on bibles, in heraldry, in personal jewelry, on hilltops, and elsewhere as an attestation or other symbol of Christianity. Crosses are a prominent feature of Christian cemeteries, either carved on gravestones or as sculpted stelae. Because of this, planting small crosses is sometimes used in countries of Christian culture to mark the site of fatal accidents, or, such as the Zugspitze or Mount Royal, so as to be visible over the entire surrounding area. Roman Catholic, Anglican and Lutheran depictions of the cross are often crucifixes, in order to emphasize that it is Jesus that is important, rather than the cross in isolation. Large crucifixes are a prominent feature of some Lutheran churches, as illustrated in the article Rood. However, some other Protestant traditions depict the cross without the corpus, interpreting this form as an indication of belief in the resurrection rather than as representing the interval between the death and the resurrection of Jesus. Several Christian cross variants are available in computer-displayed text. The Latin cross symbol ("✝") is included in the unicode character set as "271D". For others, see Religious and political symbols in Unicode. Basic variants, or early variants widespread since antiquity. Greek cross With arms of equal length. One of the most common Christian forms, in common use by the 4th century. Latin (or Roman) cross Cross with a longer descending arm. Along with the Greek cross, it is the most common form. It represents the cross of Jesus' crucifixion. Byzantine cross Latin cross with outwardly widening ends. It was the most common cross in the Byzantine Empire. Patriarchal cross (three-bar cross) Also called an archiepiscopal cross or a crux gemina. A double cross, with the two crossbars near the top. The upper one is shorter, representing the plaque nailed to Jesus' cross. Similar to the Cross of Lorraine, though in the original version of the latter, the bottom arm is lower. The Eastern Orthodox cross adds a slanted bar near the foot. Double cross The Cross of the eight-point cross-stone ceremony. It is a symbol of revival and is similar to the Greek word "XI" (the capital letter of the word Christ). Cross of Lorraine (two-barred cross) The Cross of Lorraine consists of one vertical and two horizontal bars. The two-barred cross consists of a vertical line crossed by two shorter horizontal bars. In most renditions, the horizontal bars are "graded" with the upper bar being the shorter, though variations with the bars of equal length are also seen. Papal cross A cross with three bars near the top. The bars are of unequal length, each one shorter than the one below. Cross of Salem Also known as a pontifical cross because it is carried before the Pope, is similar to a patriarchal cross, but with an additional crossbar below the main crossbar, equal in length to the upper crossbar. Monogrammatic Cross, or Staurogram or Tau-Rho Cross The earlier visual image of the cross, already present in New Testament manuscripts as P66, P45 and P75. Chi Rho/Chrismon/Labarum The Chi Rho (/ˈkaɪ ˈroʊ/; also known as chrismon) is one of the earliest forms of christogram, formed by superimposing the first two (capital) letters—chi and rho (ΧΡ)—of the Greek word ΧΡΙΣΤΟΣ (Christos) in such a way that the vertical stroke of the rho intersects the center of the chi. Stepped cross A cross resting on a base with three steps, also called a graded or a Calvary cross. Ringed cross A cross featuring a ring or nimbus. This type has several variants, including the cruciform halo and the Celtic cross. Cross of Saint Peter A cross with the crossbeam placed near the foot, that is associated with Saint Peter because of the tradition that he was crucified head down. Tau cross A T-shaped cross. Also called the Saint Anthony's cross, the Saint Francis' cross and crux commissa. Saltire or crux decussata (Saint Andrew's cross) An X-shaped cross associated with St. Andrew, patron of Scotland, and so a national symbol of that country. The shape is that of the cross on which Saint Andrew is said to have been martyred. 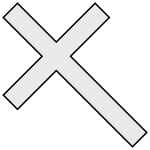 Also known as St. Andrew's Cross or Andrew Cross. Brigid's cross Bride's cross, also known as Brigid's cross or Brighid's cross, these are usually woven of rushes, wheat stalks or similar. They can be Christian or Pagan symbols, depending on context. Saint George's Cross Sometimes associated with Saint George, the military saint, often depicted as a crusader from the Late Middle Ages, the cross has appeared on many flags, emblems, standards, and coats of arms. A notable use is on the Flag of England. Its first documented use was as the ensign of the Republic of Genoa, whereafter it was used successively by crusaders. Mariner's cross (St. Clement's cross) The mariner's cross is also referred to as Saint Clement's Cross in reference to the way he was martyred. Cross of Saint Gilbert (Portate cross) A cross is usually shown erect, as it would be when used for crucifixion. The Portate Cross differs in that it is borne diagonally, as it would be when the victim bears the cross-bar over his shoulder as he drags it along the ground to the crucifixion site. Cross of Saint James A red Cross of Saint James with flourished arms, surmounted with an escallop, was the emblem of the twelfth-century Spanish military Order of Santiago, named after Saint James the Greater. Saint Julian Cross A Cross Crosslet tilted at 45 degrees with the tops pointing to the 'four corners of the world'. The image of Christianity being spread all around the world is one reason why this cross is sometimes referred to as the Missionary Cross. Grapevine cross (Saint Nino's cross) Also known as the cross of Saint Nino of Cappadocia, who Christianised Georgia. Saint Thomas Cross The ancient cross used by Saint Thomas Christians (also known as Syrian Christians or Nasrani) in Kerala, India. Cross of Saint Philip A sideways cross associated with Phillip the Apostle. Cross of Saint Florian The cross of Saint Florian, patron saint of firefighters, is often confused with the Maltese Cross (for example, the New York City Fire Department so calls it); although it may have eight or more points, it also has large curved arcs between the points. Catherine wheel Seven Catherines have been granted sainthood. This cross is composed of wagon wheels and is attributed to (at least) three saints: Saint Catherine of Alexandria, Saint Jarlath and Saint Quentin. Cross of Saint John A Latin cross with the crossing point, starting initially as wide permanent and widening only at its end to the outside arms. It is not to be confused with the Maltese cross, also known as the St. John's cross. In heraldry, it is a common figure in coat of arms. Cross of Saint Chad The cross is a combination of a Potent Cross and Quadrate Cross, which appears in the arms of the episcopal see of Lichfield & Coventry. Cross of Lazarus A cross with the ends of the arms bottonee (or botonny, i.e. "furnished with knobs or buttons"), sometimes called a cross trefly, as the ends are shaped like a trefoil. When combined with a green Maltese cross, it forms the insignia of the Order of Saints Maurice and Lazarus. Armenian cross Symbol of the Armenian Apostolic Church, and a typical feature of khachkars. Also known as the "Blooming Cross" owing to the trefoil emblems at the ends of each branch. Bolnisi cross Ancient Georgian cross and national symbol from the 5th century AD. Caucasian Albanian cross Ancient Caucasian Albanian cross and national symbol from the 4th century AD. Armenian cross-stone (Khachkar) A khachkar (cross-stone) is a popular symbol of Armenians. Canterbury cross A cross with four arms of equal length which widen to a hammer shape at the outside ends. Each arm has a triangular panel inscribed in a triquetra (three-cornered knot) pattern. There is a small square panel in the center of the cross. A symbol of the Anglican and Episcopal Churches. Celtic Cross Essentially a Greek or Latin cross, with a circle enclosing the intersection of the upright and crossbar, as in the standing High crosses. Coptic ankh Shaped like the letter T surmounted by an oval or circle. Originally the Egyptian symbol for "life", it was adopted by the Copts (Egyptian Christians). Also called a crux ansata, meaning "cross with a handle". Coptic cross The original Coptic cross has its origin in the Coptic ankh. As depicted in Rudolf Koch's The Book of Signs (1933). New Coptic Cross This new Coptic Cross is the cross currently used by the Coptic Catholic Church and the Coptic Orthodox Church of Alexandria. It evolved from the older Coptic Crosses depicted above. A gallery of Coptic Crosses can be found here. Cross and Crown A Christian symbol used by various Christian denominations, particularly the Bible Student Movement and the Church of Christ, Scientist (Christian Science). It has also been used in heraldry. The emblem is often interpreted as symbolizing the reward in heaven (the crown) coming after the trials in this life (the cross) (James 1:12). East Syrian cross Syriac Orthodox cross. 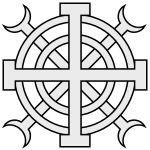 Gnostic cross Cross used by the early Gnostic sects. Maltese cross An eight-pointed cross having the form of four "V"-shaped elements, each joining the others at its vertex, leaving the other two tips spread outward symmetrically. It is the cross symbol associated with the Order of St. John since the Middle Ages, shared with the traditional Knights Hospitaller and the Sovereign Military Order of Malta, and by extension with the island of Malta. Nestorian cross In Eastern Christian art found on tombs in China, these crosses are sometimes simplified and depicted as resting on a lotus flower or on a stylized cloud. Occitan cross Based on the counts of Toulouse's traditional coat of arms, it soon became the symbol of Occitania as a whole. "Carolingian cross" Cross of triquetras, called "Carolingian" by Rudolf Koch for its appearance in Carolingian-era art. Rose Cross A cross with a rose blooming at the center. The central symbol to all groups embracing the philosophy of the Rosicrucians. Serbian cross A Greek cross with 4 Cyrillic S's (C) in each of its angles, which represent the imperial motto of the Palaiologos dynasty when he resurrected the Byzantine Empire: King of Kings, Ruling Over Kings (βασιλεὺς βασιλέων, βασιλεύων βασιλευόντων - Basileus Basileōn, Basileuōn Basileuontōn). A national symbol of Serbia and symbol of the Serbian Orthodox Church. Shield of the Trinity Early variant of the Trinity Shield with the Christian cross on the bottom portion. Suppedaneum cross Also known as Russian cross, Slavic or Slavonic cross. A three-barred cross in which the short top bar represents the inscription over Jesus' head, and the lowest (usually slanting) short bar, placed near the foot, represents his footrest (in Latin, suppedaneum). This cross existed in a slightly different form (with the bottom crossbeam pointing upwards) in Byzantium, and it was changed and adopted by the Russian Orthodox Church and especially popularized in the East Slavic countries. Macedonian Cross, also known as Veljusa Cross. Macedonian Christian symbol, symbol of the Macedonian Orthodox Church. Anuradhapura cross A symbol of Christianity in Sri Lanka. Nordic cross/Scandinavian cross The cross design represents Christianity, and the characteristic shift of the center to the hoist side is early modern, first described as the Danish civil ensign (Koffardiflaget) for merchant ships in a regulation of 11 June 1748, which specified the shift of the cross center towards the hoist as "the two first fields must be square in form and the two outer fields must be 6/4 lengths of those". Marian Cross A term invented to refer to Pope John Paul II's combination of a Latin cross and the letter M, representing Mary being present on Calvary. Off Center Cross of Christian Universalism. The off-center cross was invented in late April, 1946, in a hotel room in Akron, Ohio, during the Universalist General Assembly, where a number of Universalist ministers pooled their ideas. 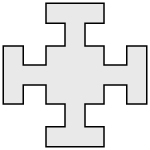 Ordnance Survey cross symbols Used on Ordnance Survey maps to represent churches and chapels. 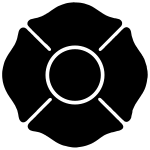 A cross on a filled square represents a church with a tower; and a cross on a filled circle represents a church with a spire. Churches without towers or spires are represented by plain Greek crosses. These symbols also now refer to non-Christian places of worship, and the cross on a filled circle also represents a place of worship with a minaret or dome. Crucifix A cross with a representation of Jesus' body hanging from it. It is primarily used in Catholic, Anglican, Lutheran, and Eastern Orthodox churches (where the figure is painted), and it emphasizes Christ's sacrifice— his death by crucifixion. Altar cross A cross on a flat base to rest upon the altar of a church. The earliest known representation of an altar cross appears in a miniature in a 9th-century manuscript. By the 10th century such crosses were in common use, but the earliest extant altar cross is a 12th-century one in the Great Lavra on Mt. Athos. Mass in the Roman Rite requires the presence of a cross (more exactly, a crucifix) "on or close to" the altar. Accordingly, the required cross may rest on the reredos rather than on the altar, or it may be on the wall behind the altar or be suspended above the altar. Blessing cross Used by priests of the Eastern Catholic, Eastern Orthodox and Oriental Orthodox Churches to bestow blessings upon the faithful. Cross necklace A small cross or crucifix worn as a pendant on a necklace. High cross A large stone cross that is richly decorated. From the 19th century, many large modern versions have been erected for various functions, and smaller Celtic crosses have become popular for individual grave monuments, usually featuring only abstract ornament, usually interlace. Processional cross Used to lead religious processions; sometimes, after the procession it is placed behind the altar to serve as an altar cross. Crux gemmata A cross inlaid with gems. Denotes a glorification of the cross, this form was inspired by the cult of the cross that arose after Saint Helena's discovery of the True Cross in Jerusalem in 327. Pectoral cross A large cross worn in front of the chest (in Latin, pectus) by some clergy. Globus cruciger Globe cross. An orb surmounted by a cross; used in royal regalia. ^ Hutado, Larry (2006). "The staurogram in early Christian manuscripts: the earliest visual reference to the crucified Jesus?". In Kraus, Thomas. New Testament Manuscripts. Leiden: Brill. pp. 207–26. ISBN 978-90-04-14945-8. ^ Herren, Michael W.; Brown, Shirley Ann (2002). Christ in Celtic Christianity: Britain and Ireland from the Fifth to the Tenth Century. Boydell Press. p. 192–200. ISBN 0851158897. ^ "NSC NETWORK – Analogical review on Saint Thomas Cross- The symbol of Nasranis-Interpretation of the Inscriptions". Nasrani.net. Retrieved 2011-12-10. ^ "General Instruction of the Roman Missal, 117" (PDF). Retrieved 2011-12-10.